Beard Wash and Softener (50 ml): The wash has a very gentle lather that is soft enough for your face and tough enough to handle curly, coarse beard hairs. We recommend applying the beard wash once a day, but you can use it twice if you are in environments where your beard gets dirty regularly. The wash is made from a blend of Aloe Vera juice, Mandarin Oil along with natural flower water. It is scented with Lavender essential Oil and lime extracts that leave a mild, fresh citrus aroma. After using it, you'll notice that running a comb through your beard is now much smoother, making styling and shaping your facial hair a much easier process. 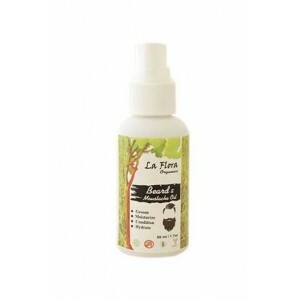 Usage: Use just like a shampoo rub a few drops into your beard until it begins to lightly foam and lather. For best results, leave the wash and softener in your beard for a few minutes before rinsing it out. 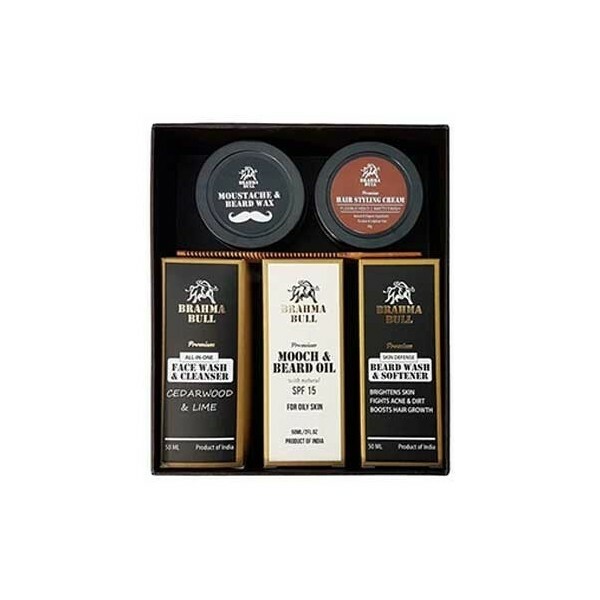 All-In-One Cedar Wood, Lime Face Wash, and Cleanser (50 ml): Energize and clear your skin using powerful natural ingredients with the best face wash for people with oily skin from Brahma Bull. Usage: Wet your face with warm water, pour a quarter-sized dose into the palm of your hand and work into a rich lather. Wooden Comb: Brahma Bulls Wooden Combs are the finest on the market. Unlike a typical molded plastic comb, our combs are handmade. Each comb tooth is saw cut, then the overall comb is finished by skilled craftsmen which give it a buttery smooth finish and helps prevent split ends. The teeth are specifically rounded to avoid unnecessary irritation ensuring that you get the very best experience from each use. The two widths to the teeth allow you close control for even the most demanding styles. 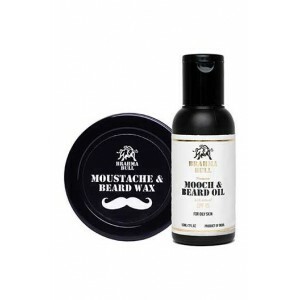 Moustache Wax (50 g): Do you want the look of a sculpted 'stache? Are you sick of your 'stache falling into your mouth when you eat? 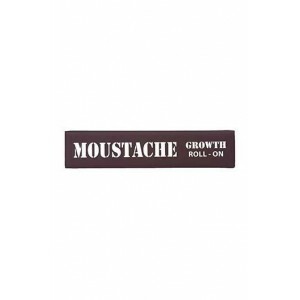 Your solution could very well be found conveniently in our Moustache Beard Wax. It is in high-quality cosmetic Jar, so its warm and ready for use. It is made only with natural ingredients, including beeswax, jojoba oil, and lanolin. 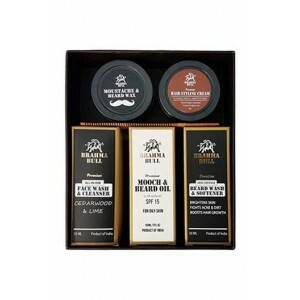 Brahma Bull Moustache and Beard Wax provides a medium hold and is perfect for a natural style that keeps the Moustache out of the mouth. This wax will provide enough hold for a very natural shape with some pliability, and the hold will last all day. Usage: Take a small amount in your index finger. Then spread evenly on the index fingers of both the hands. 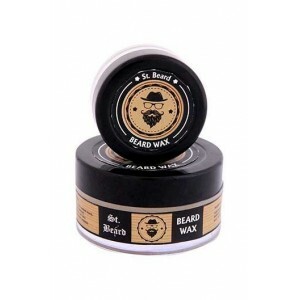 Then use the Wax to style the beard and mustache into your desired shape. Hair Styling Cream (50 g): A Hair styling cream like none before! This formulation provides quick light styling, fantastic manageability and leaves your hair nourished. A newcomer to the hair styling stage can not - go wrong with this cream. Subtle control with low shine! Usage: Put a fingernail-sized amount into the palm of your hand and rub palms together to warm and emulsify the cream. Apply evenly throughout damp or dry hair. Apply to dry hair for classic, finger combed looks with light shine, or apply to damp hair for a controlled, just-out-of-the-shower look. Use more cream for increased hold and style. Run a comb through hair for a more finished look. 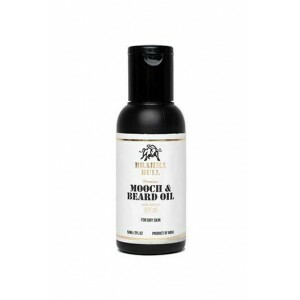 Mooch and Beard Oil for Oily Skin (50 ml): It is for men who crave sheen and luster to their beards that only the best of White Tea, Aloe Vera, and Chamomile Oil can provide. It contains Jojoba Oil which is prized for its ability to help with the healing process of the skin. Add to it a dash of Raspberry See Oil and you have a well-balanced elixir. 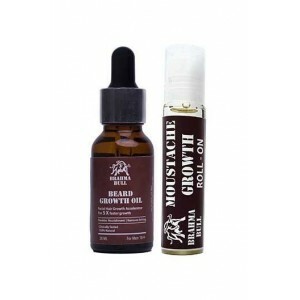 This beard oil is tenacious, permeates the senses and leaves you wanting more before it's even gone. Usage: Take a few drops of the Oil in your palms and massage gently on your Beard. Message taking each strand of Beard, and then gently comb it as style it as desired. Disclaimer: Every piece is a creation of artisans and based on craft styles, some being centuries old.